Pound 360: How bad is the global warming crisis? Here's a simple explanation. 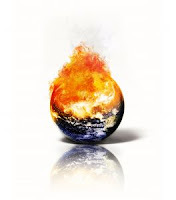 How bad is the global warming crisis? Here's a simple explanation. Every year, we humans pump 10 billions of CO2 into the atmosphere. The problem is nature (plants and oceans in particular) can only sequester 5 billion tons of CO2 per year. That's why CO2 levels have climbed from a post-industrial age level of 280 parts per million (PPM) to 387 PPM, and it's growing 2PPM each year. "It's just like water in a bathtub -- unless more water is draining out than flowing in from the tap, eventually the bathtub will overflow," explains MIT researcher John Sterman in a recent TIME feature, "What the Public Doesn't Get About Climate Change." When Sterman asked 200 MIT students how much governments had to (force businesses to) cut CO2 emissions, 84 percent of them answered wrong (the answer is 50 percent if you do the math on the numbers at the start of this post). Average Americans don't grasp the severity of our situation either. According to a UN study, 54 percent favor a "wait-and-see" approach to global warming. Even Bill Gates doesn't get it. Referring to global warming in Beijing last year he said, "You know, we have time to work on it." But according to TIMES correspondent Bryan Walsh, "we don’t." The bathtub is already overflowing. Thanks on your marvelous posting! I certainly enjoyed reading it, you can be a great author. I do not know whether it's just me or if perhaps everybody else encountering issues with your site. It looks like some of the written text in your content are running off the screen. Can somebody else please comment and let me know if this is happening to them too? This may be a problem with my internet browser because I've had this happen previously. Hi, There's no doubt that your web site could be having internet browser compatibility issues. Whenever I look at your blog in Safari, it looks fine however when opening in IE, it has some overlapping issues. I merely wanted to give you a quick heads up! Aside from that, wonderful website! Hi, I do believe this is a great web site. I stumbledupon it ;) I'm going to revisit yet again since I book marked it. Money and freedom is the best way to change, may you be rich and continue to help other people.